I loved doing baby led weaning with my kids but finding baby led weaning recipes for the whole family? Ugh. There was always something my kids loved but I was bored of or something I fancied but I knew wouldn’t be suitable for my kids. Most of us have a few recipes that we turn to again and again and it’s no different if you’re making baby led weaning family meals – you just want something that everyone can enjoy together! Today I’m sharing some ideas that our whole family enjoyed plus some ideas from other bloggers I hope you’ll enjoy too! As well as looking online for inspiration there were a couple of baby led weaning recipe books that I loved and that gave me tons of inspiration – The Baby Led Weaning Cookbook is a classic and one I shared with lots of friends and I really enjoyed the River Cottage Baby and Toddler Cookbook too. If you’re just starting out on baby led weaning then the two things I would really recommend worth buying that will make your life a lot easier are some of these bibs that are great at catching any dropped food and you really, really need a highchair that’s easy to clean (sorry!) I used this one with both my kids and everyone I know whose used one has raved about it too. 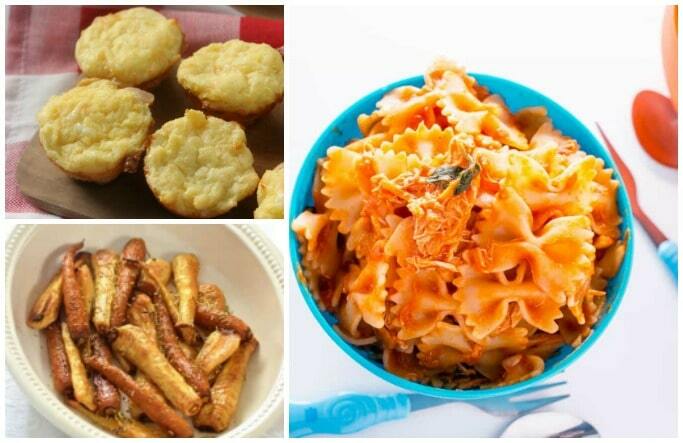 Need some easy ideas for finger foods? I’ve got eight in the video below that I used with my kids! Obviously advice on weaning babies changes over time as more research come out so with these recipes do use a bit of common sense as well as your own knowledge on what the current guidelines are. The NHS Start For Life guide to first foods is great and recommends that you avoid shark, swordfish or marlin, raw shellfish, honey, nuts, sugar and salt. Always cut grapes and cherry tomatoes, in fact before you start baby led weaning I’d highly recommend a quick google of choking hazards so that you are up to date on the latest advice and go with the recipes that are suitable for your child’s age. Some of these baby led weaning recipes are perfect for making a meal for the whole family while others may need other things adding to them to create a full meal.